The husband of a beautiful harpist recently commissioned a painting of his wife's concert harp with an animal to celebrate their 30th wedding anniversary. As we explored what animals might take up the harp, we thought about the instrument's voice and essence. Perhaps the golden-cheeked gibbon could pluck every string with her long furry arms or the playful watery spirit of a river otter might strike the most etherial chords. After considering many different creatures, we decided on owl whose hoot is heard in night's mysterious symphony. 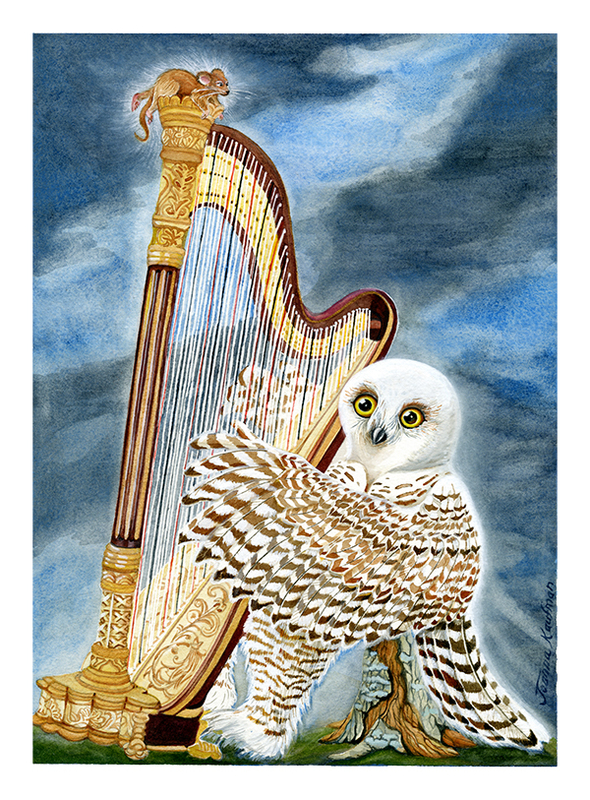 Before making the painting, I researched the position of the concert harp and learned that it should be leaned onto owl's right shoulder so that she can reach all 47 strings and seven pedals at the foot. The pedals allow this grand harp to play all sharps and flats within a 6 and a half octave range, making it part of the orchestral family of instruments. Here, a female snowy owl sits on a wooden stump covered with some lichens, reminiscent of a standing dead tree where she might perch in the wild. Mouse gazes at owl and is illuminated with her music.